NES Hydlide (USA) in 05:11.62 by dunnius. 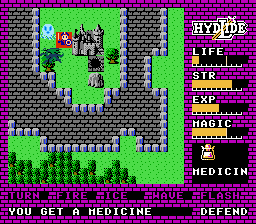 Hydlide is an old and somewhat notorious game, mostly because it has very strange gameplay mechanics. For the first part of the game, walking consumes health, and the character must stop every now and then to regain it. This is one of the few games (the only one?) where the level grinding sequences are actually entertaining, while the boss fights aren't. Hitting a boss decreases your own health as well as the boss's, after which there is much waiting for more health until you can hit him again. This is an improvement of 3:54.79 over the previous TAS, due to overall better levelling strategy and route planning. There is also a submitted TAS that uses codes and removes the need to level grind or wait for health.